In addition to aggregates, cement, and water, reinforcing steel is one of the key building components of precast products. Steel price fluctuations observed on global markets have a large impact on the cost of production of precast products made of reinforced and prestressed concrete. An important issue is, therefore, the proper planning of steel orders and deliveries to the precast concrete plants. A significant number of competing warehouses and construction warehouses offer diversified steel prices, which are subject to frequent changes in relatively short periods. This results in a problem in the selection of an appropriate procurement strategy by precast concrete plants. An additional unfavorable factor is the ordering of reinforcing steel that is too large in relation to the demands of the precast concrete plants, resulting in high costs of its storage in the warehouses or storage yards. In this paper, the issues of optimal planning and delivery of plain, ribbed, and prestressing steel were discussed. For the research and calculation purposes, supplies of steel from four wholesalers to four different precast concrete plants were assumed. In addition, the types of steel and the class of bars used to reinforce the elements were discussed. A different level of unit prices for the purchase and delivery of steel in each warehouse and a different demand for each of the four concrete plants were also assumed. As a result of the analyses carried out, a model was developed, including the strategy of purchasing and supplying plain, ribbed, and prestressing steel with the assumption of minimum costs. Steel has a very important function in building constructions, providing the possibility of transferring the tensile stresses occurring in the cross section of the element. Depending on the type of function performed in the facility, the element has a different degree of reinforcement, which also translates into costs related to the purchase of steel. In the case of a continuous footing made of a reinforced concrete for a single-family building, the cost of steel purchase may account for about 15% of all costs (Jankowski and Antkiewicz 2018). Reinforcement assembly for building elements is associated not only with the use of different types of reinforcing bars but also with different technologies of its implementation. In reinforced concrete structures, it is necessary to ensure, among other things, a minimum concrete cover for reinforcing bars, whereas with prestressed constructions, it is also important to program the appropriate tension for the prestressing steel strands. This is related to the fulfillment of many conditions, such as, for example, selection of the prestressing force and calculation of losses of the prestress. The fulfillment of these conditions, as well as the ensuring of an appropriate dimensional tolerance of the elements, with the simultaneous reproducibility in the production process, contributes to the use of prefabrication technology. Generally, the challenges posed by precast production technologies are related to raising up the production efficiency and shortening the time of performing production activities and concrete curing processes, as well as prefabrication deliveries to the right time and place at the construction sites, in accordance with the just-in-time methodology (Shin et al. 2011). Over the last years, the amount of information necessary for construction processes has significantly increased. 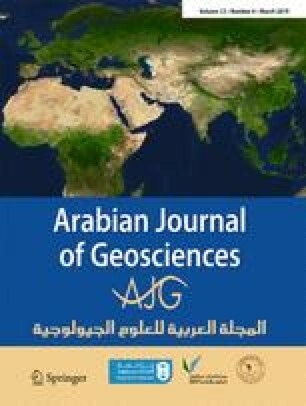 Some support came with the introduction of technology radio-frequency identification (RFID) and wireless sensor network (WSN), which in the future may play a key role in improving collection and sharing of information in the supply chain process (Jaselskis and El-Misalami 2003; Song et al. 2006; Yagi et al. 2005; Chin et al. 2005; Sangyoon et al. 2008). The influence of the building information modeling (BIM) on the precast concrete industry, observed in recent years, needs to be considered too (Foremny and Nicał 2013; Nicał and Wodyński 2016; Grzyl et al. 2017). These technologies contribute to the increasing improvement of the enterprise resource planning (ERP) method in concrete precast plants, including the material requirements planning (MRP) standard, which is responsible for resource planning in the preproduction phase (Nicał 2018a, 2018b). Although BIM and RFID enriched ERP, some pragmatic problems still cannot be solved (Zhiliang and Zhitian 2015). A proper scheduling and the right amount of raw material supplies, resulting from the current needs of the precast concrete plant, are significant so that the production is profitable. Some research areas address the development of models combining optimal scheduling for production and internal and external transport as well as planning and further resource allocation strategies with regard to time-cost optimization (Radziszewska-Zielina and Kania 2017). However, the problem of using inaccurate planning methods, insufficient resource utilization, and overstocking was noticed many years ago (Dawood 1993; Chan and Hu 2002) and, in many cases, is still present. A very important issue is also the appropriate choice of steel reinforcement, which should take into account the current state of it, such as, e.g., the quality of the external surface, and in particular the elimination of corroded places. It is also reasonable to introduce methods of selecting steel suppliers who will meet the predetermined criteria, depending on the preferences of the decision-maker. Such solutions have already been developed, among others, in the automotive industry using fuzzy logic (Toklu 2018). The growing influence of fuzzy set theory in construction projects is also worth noting in which, apart from high steel consumption, the issues of risk factors are discussed (Ibadov 2016; Ibadov 2018). The wrong choice of steel reinforcement suppliers affects not only the costs and duration of construction projects but also the durability of the entire reinforced concrete or prestressed structure. Determining the criteria for selecting steel suppliers is, therefore, an area for further research, which must be expanded, including the aspects of the use of waste in the production cycle and the impact of different additives on the mechanical properties of steel. Considering the supply needs as well as the qualitative and technological needs of reinforcing steel, the problem becomes complex. Therefore, it is necessary to develop a tool which enables to find the optimal procurement strategy, minimizing the cost of purchase, while meeting the needs of the concrete plants and taking into account the steel reinforcement resources. The research assumes that all steel reinforcement warehouses offer the same steel in terms of quality and impact on the mechanical properties of the entire building element and aspects of waste utilization. The criteria assessed were only the purchase and delivery of steel reinforcement of various types and cross-sectional diameters from various reinforcement steel warehouses. Depending on the chemical composition, the type of production technology, the shape of bars, and other factors, reinforcing steel has mechanical, strength, and utility characteristics. They determine its usefulness and scope of application (Bielawski et al. 1982). Depending on the type of steel product planned in the production process, the following plastic working processes of steel are distinguished: rolling, drawing, forging, and pressing. In addition, rolling can be carried out either cold or hot. The most important mechanical properties of steel, among others, are yield strength of the steel and the tensile strength, ductility, and fracture toughness (Żmuda 2016). The detailed scope of requirements in the field of mechanical properties of steels is defined in technical standards and can be varied in many countries around the world. In addition, the properties of steel also include its weldability and suitability for use in structures subjected to repeatedly variable loads. An exemplary classification of steel grades is shown in Table 1. Strength requirements for reinforcing steel used for the prestressed concrete structures are significantly higher. As reinforcement, plain, indented, or ribbed reinforcement wires, bars, and strands made of high-carbon steels are used, which are subjected to cold pull processes. The wires are then connected and spirally twisted to form strands, generally 3- or 7-wire strands. An exemplary classification is shown in Table 2. Additionally, in the production of precast reinforced concrete elements, depending on their type, mesh for reinforcing plate elements may be used. Their width is usually matched to the width of the element. They consist mainly of supporting and transverse bars; the dimensions of which may vary. Exemplary types of meshes with the size of the apertures are shown in Table 3. In addition, the price of reinforcing bars (rebar) is influenced by their diameter and steel grade. Rods made of high-strength steel are more expensive than those made of lower-grade steel. However, rods with larger diameters are cheaper than rods with smaller diameters. The average price of carbon steels in the world in the last 12 months ranged from about $550 to $700 for a wire rod (mesh) and from about $530 to over $640 for rebar for a metric ton (1.1023113 tons). A detailed list is shown in Fig. 1 (MEPS - World Carbon Steel Prices 2018). EXW (Ex-Works) means the seller delivers when it places the goods at the disposal of the buyer at the seller’s premises or at another named place (i.e., works, factory, and warehouse). The seller does not need to load the goods on any collecting vehicle, nor does it need to clear the goods for export, where such clearance is applicable. FOB (free on board) means that the seller delivers the goods on board the vessel nominated by the buyer at the named port of shipment or procures the goods already delivered. The risk of loss of or damage to the goods passes when the goods are on board the vessel, and the buyer bears all costs from that moment onwards (International Chamber of Commerce 2018). 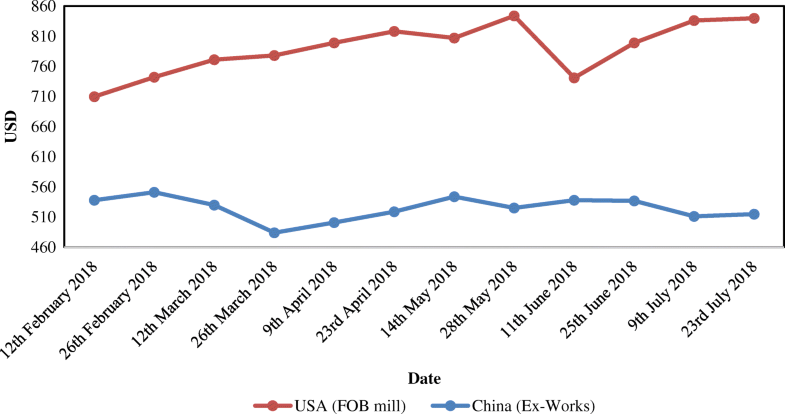 When comparing steel prices, for example, between the US and Chinese or West European markets, the terms FOB mill and Ex-Works are treated equivalently. In the world export market, there is the concept of FOB port of export. The difference in the price of rebar in the period between February 2018 and July 2018 between the American and the Chinese markets is shown in Fig. 2 (Steel Benchmarker Price History Tables and Charts 2018). Differences in the price of the rebar also affect the price of the prestressing strands. The prices of the prestressing strands offered on the Chinese market vary between approximately $550 and $900 dollars per metric ton. One of the basic problems occurring in the logistics processes of the precast concrete industry is the linking of reinforcement steel houses with the concrete plants. The precast concrete plant’s task is to optimize the connections so that the demand for steel reinforcement can be met at the lowest costs of purchasing and transporting them. In this paper, four concrete plants (i = 1, 2, 3, 4) have been selected to which the steel reinforcement must be delivered from four steel warehouses (j = 1, 2, 3, 4), on which there are five types of reinforcement (k = 1, 2, 3, 4, 5) with the different shapes and dimensions of the cross sections. There are two diameters accounting for 8 mm and 12 mm of the ribbed steel bars and one diameter accounting for 6 mm of the plain steel bar, the wire rod (mesh), and the 7-wire strand for prestressed concrete elements. Total purchase and transport costs of the selected steel reinforcement type k from the given steel warehouse j to the precast concrete plant i are presented in Table 4. Considering the conditions presented above, it should be decided how many tons of steel reinforcement should be ordered and delivered to each concrete plant so that the total cost is minimal. In addition, the percentage demand for steel reinforcement types by the precast concrete plants, presented in Table 5, should be taken into account. The total resource steel reinforcement in steel warehouses j accounts for W1 = 1000 tonnes, W2 = 2700 tonnes, W3 = 2900 tonnes, and W4 = 1400 tonnes, and the total precast concrete plant i demands for steel reinforcement are the following: CP1 = 1900 tonnes, CP2 = 2200 tonnes, CP3 = 2300 tonnes, and CP4 = 1600 tonnes. The research problem presented in this paper can be solved by the linear programming method (Radzikowski and Sarjusz-Wolski 1994) in the following six steps (Fig. 3). wherein xij ≥ 0, for i = 1, 2, 3, 4 and j = 1, 2, 3, 4. After completing all the six steps and using the linear programming, the following results were obtained, as shown in Table 6. The total steel reinforcement resources are equal to the total demands of the precast concrete plants and account for 8000 tonnes. Therefore, condition 4 is met. Considering the steel reinforcement types and dimensions of the cross sections and the demands of the precast concrete plants, the optimal tonnage of orders and deliveries is presented in Table 7. The calculation was carried out by means of the Microsoft Excel 2013 spreadsheet solver. Nonnegative values for unrestricted variables were taken into account during the calculation process. 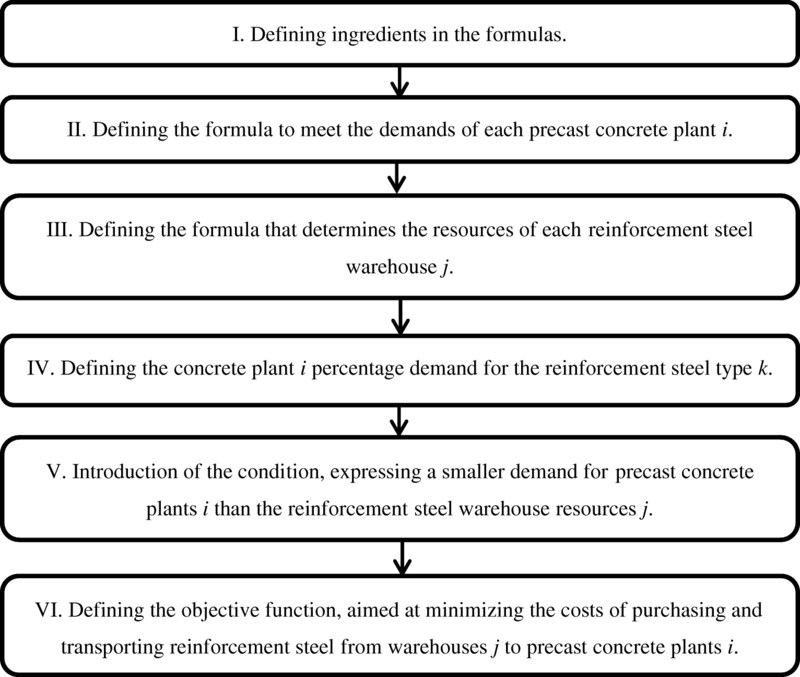 The study established proceeding steps in steel reinforcement purchase and transportation procurement from different steel warehouses to precast concrete plants, considering optimization in terms of cost. In order to search for an optimal procurement strategy, meeting the minimum purchase and transportation costs while limiting the steel reinforcement resources and the precast concrete plants’ demand, a linear programming was applied. For experimental purposes, a case study of four precast concrete plants and four steel reinforcement warehouses was used. Steel reinforcement was divided into the following five different types: 8-mm ribbed steel bar, 12-mm ribbed bar, 6-mm plain steel bar, wire rod (mesh), and 7-wire strand (12.7 mm). Types of such reinforcement find application in a very large number of production plants of reinforced concrete and prestressed construction elements. Prices of ribbed, plain, and 7-wire strand reinforcement were selected on the basis of steel price analyses on global markets. In addition, the prices of structural reinforcement, including the American and Chinese markets in the Ex-Works and free on board modes of transport, were analyzed. This allowed examining the tendency of steel prices to change over months in different markets and its reference to global conditions. The optimal strategy of steel reinforcement purchase and transportation considering the lowest possible costs is presented in Table 8. Finally, the optimized purchase and transportation strategy, including overall and varied percentage of steel reinforcement types and cross-section demands by each precast concrete plant, was achieved with the lowest costs accounting for 4,632,065.00 USD. The calculations had an assumption that variables can only be natural numbers, including zero. The results show that the adopted assumptions to optimize purchase and transportation of steel reinforcement are effective. The presented model of proceeding, based on six subsequent steps, is a practical and clear procedure for the decision-making processes concerning steel purchases for the production needs of reinforced and prestressed concrete elements. It is necessary to consider the variability of conditions under which precast concrete plants and steel warehouses are operating. It is strictly related to diversified conditions regarding the supply and demand on the construction market, which affect, i.e., the level of price volatility. Attention should also be paid to state regulations regarding transportation, taxation of steel in international trade, currency exchange rates, and other risks. It seems, therefore, necessary to supplement the decision-making and optimization models with a probabilistic-statistical approach. For this purpose, the application of simulation methods that determine orders in variable conditions should also be taken into account.